I have a LM7805 on a project and I need to power 2 devices that use 3.3V: a CD4050 (level shifter) and a Nokia 5110 LCD display. The CD4050 is necessary because the LCD is 3.3V and the microcontroller will be run at 5V. Is it ok to power the 4050 and the LCD display using only 2 x 1/4W resistors in a voltage divider? I figure 390R and 200R resistors will give me 3.3V from a 5V input. Why not use LD1117V33 or LM3940? 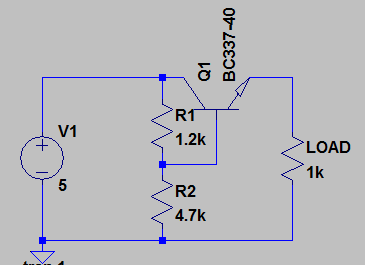 Resistors do NOT hold the same voltage, if current is drawn. I don't have them and they are not easy to source around here. Ordering them from the internet would take too long, since our postal service is on strike. I estimate less than 60mA when the backlight is on. An alternative would be to use a transistor or op-amp, AFTER the resistor dividers. (Configured as a simple voltage regulator alternative). The transistor circuit, needs to be about 0.7V higher, to account for the Veb drop. I DON'T know what components you have to hand, to supply circuits. And that's the thing, when your backlight goes off, your voltage goes up and fries your LCD. Can you get an LM317 and run it off whatever is running the LM7805? EDIT: back when it was difficult for me to get spare parts, I used to raid junk electronics. I can't imagine it would be very hard to find a 3.3V regulator. You can't just calculate the R1/R2 division - that will only work with no load. It's generally ok with an op-amp input, for example, as those blighters theoretically have infinite input impedance. But you are placing an actual load. It is going to be restricted in current available by R1 alone, and in parallel with R2 will totally change the ratio making your simple R1/R2 divider wrong. You need to find the parallel R2 + load. This method can actually work if you use very low resistances. Disadvantage is we are talking really high wattage ceramic wire wound resistors that glow nearly as hot as a bar fire. Back in the early 1970's colour TVs actually used this method of "dropper resistors" that would wind the electricity meter into a £££ overdrive and nearly set fire to the curtains in the living room. Op-amps usually have a max output current of about 25 mA's, so 60 mA's is too much for most of them, without an extra pass transistor or particularly high current one. (Sorry, it was me who first mentioned using them in this thread). Thank you for the replies, fellows. I understood the explanation and the circuit. I'll keep you posted when I have it working somehow or if I have more doubts. If I'm not completely off here the backlight is separately on the nokia lcds so you can run that from 5 volts like any other LED. Then the lcd controller chip, PCD8544, will just use a about 250 uA. With those low values in the voltage divider they probably be stiff enough especially since the PCD8544 is happy with VCCs down to 2.7 volts. make sure 3.3V parts stay in power supply spec. A red LED may do, as long as the maximum forward current rating isn't exceeded. Problem with Red LED is its spec Vth is not tested for min max limits. datasheet min max limits are actually tested for on devices. This is usually close enough for a lot of applications. Nothing that might oscillate however.